Welcome to the blissful land that is known as Shang Ri La, first documented many moons ago by the author James Hilton. Whether it exists or not remains to be seen but until then lots of people have drawn inspiration from the Legend of Shangri-La. This includes NetEnt who, we feel have developed a stunning representation of the mystiThe Legend of Shangri-La at casino.comcal kingdom in their slot game. 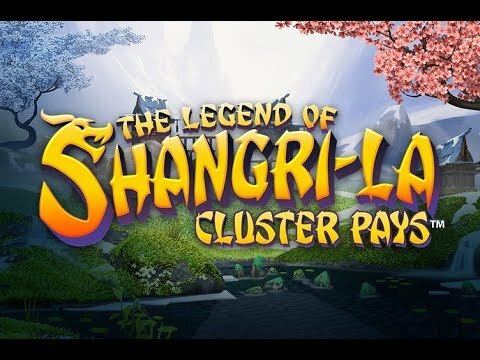 The Legend of Shangri-La is a 6-reel slot that actually offers cluster pays as the ways to win. So, there are no formal win lines as such. You need to simply land clusters of symbols in groups of at least 9 adjacent to each other, in order to win. With a beautiful cherry blossom tree on one side and a wise guru on the other, the reels spin away with an almost peaceful feel to them. 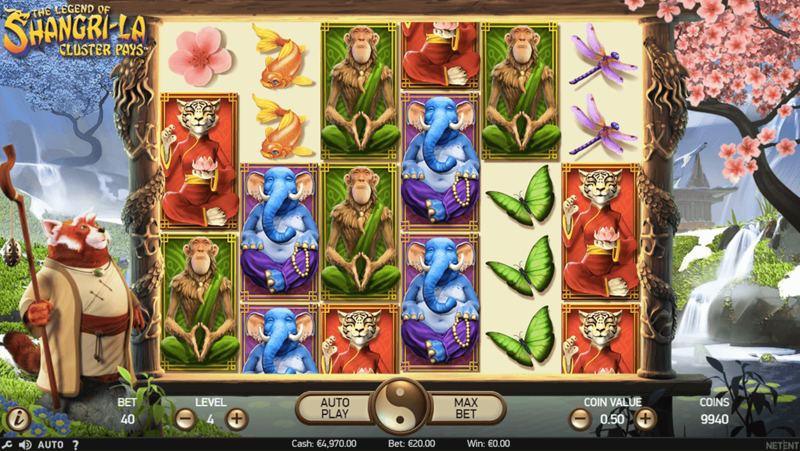 Bet Amounts – Betting on the Legend of Shangri-La begins at 10p per spin and can be increased up to a maximum of £200 per spin, for those with balances to afford it. To change your bet, amend the coin level to the left of the screen and coin value to the right until you reach your desired stake. Wild Symbol – A green orb containing a question mark is your wild symbol. It will substitute for all other symbols except the scatter. In this game the wild is called the substitution symbol, as it will transform into whichever adjacent symbol will form the biggest win. Scatter Symbol – A map of Shangri-La is your scatter symbol and landing 3 or more anywhere in view will trigger the bonus spins round. Sticky Respins Feature – Should you be lucky enough to land x2 matching clusters between 5 and 8 symbols, you will trigger this feature on the Legend of Shangri-La. Those two clusters will become sticky and stay in place whilst the reels respin. If you land new matching symbols to those in the sticky clusters, then you will be awarded another respin. This will continue until no new matching symbols land! Random Wilds Feature – To trigger this feature you will need x2 matching clusters of at least x4 symbols. Manage this and wilds will then be added to the reels to connect the two clusters together forming one huge cluster and in turn a huge win! Scatter Nudge Feature – Ever had that moment when you have two scatters on the reels and a third lands just out of view? Well fear not for in the Legend of Shangri-La there is the scatter nudge feature to save you. It doesn’t always trigger but on occasion when you have two scatters and need the third, it will be nudged up or down until it helps activate the bonus for you! Bonus Spins Feature – As if all of that wasn’t enough there is still the bonus spins to deal with! Land three or more scatter symbols anywhere in view to trigger the bonus. 6 scatter symbols will award 8 bonus spins. During the bonus spins round, after each spin you will be allocated between x2 to x6 wilds to the reels. The first 2 wilds will be added at random with the remainder being added as a cluster. Just to help you out as well, if the total winnings from the round is less than x10 the total bet amount, you will get one more spin to try to increase your winnings. What can we say about the Legend of Shangri-La to explain how much we love this game? There is a multitude of features all geared towards giving you the best chances of claiming those winning clusters. On the whole the game is well designed with interesting graphics, animations and of course that relaxing music helps too. We aren’t sure if we believe that Shangri-La really exists but if it does we think we may have found it.